Chemical peels can address a variety of dermatological imperfections, such as acne scars, sun damage, and fine lines. By removing the top layer of damaged skin, a chemical peel can reveal a healthier, more youthful complexion. Dr. Julio Clavijo-Alvarez and our onsite medical aesthetician will meet with you to discuss your skin concerns and the different skin treatments available to address your needs. At ReNova Plastic Surgery in Pittsburgh, PA, we are passionate about helping our patients achieve increased confidence through our aesthetic treatments. You can count on us to recommend a treatment that that can help you love what you see when you look in the mirror, and to feel secure and outgoing in your everyday life. What can Chemical Peel treat? This procedure is not recommended for patients with darker skin tones, as it can cause pigmentation issues. Patients who are prone to scarring, keloids, or take Accutane or Retin-A may not be suitable candidates for a chemical peel. During your consultation, Dr. Clavijo-Alvarez will determine if a chemical peel or another procedure is right for you. Chemical peel treatments can be adjusted to treat specific issues. Glycolic acid is applied onto the skin to address fine lines, uneven skin texture, dry skin, and acne. Because this is a mild solution, most patients can return to normal activity immediately following treatment. You may experience some redness and mild stinging afterward. For patients with age spots, more apparent wrinkles, and hyperpigmentation, a stronger chemical agent such as trichloroacetic acid (TCA) can be applied. Treatment is designed to penetrate the middle layer of skin. Side effects will last longer than a light chemical peel, but require less downtime than a deep peel. As the strongest facial peel available, this procedure uses phenol acid to penetrate the underlying layers of skin to address deeper facial wrinkles, age spots, and sun damage. 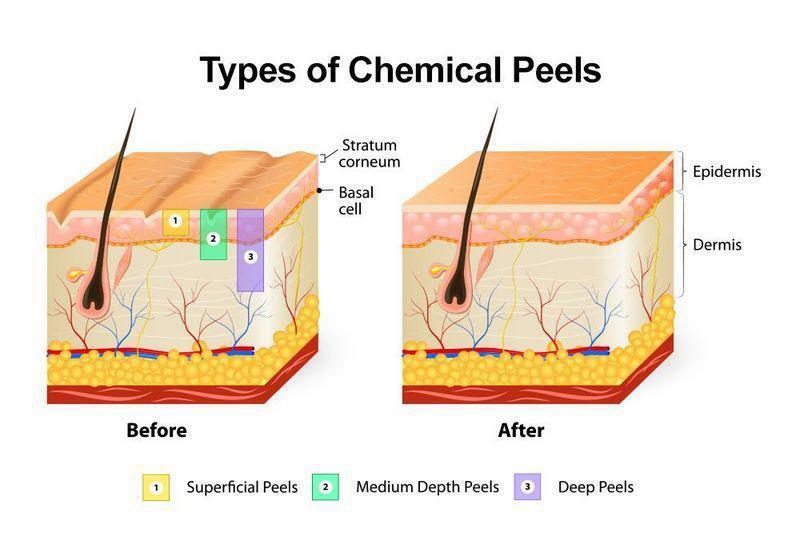 Due to the strength of the chemical agent used, patients who undergo deep chemical peels typically experience increased peeling and can require several months to heal completely. You can count on us to recommend a treatment that that can help you love what you see when you look in the mirror, and to feel secure and outgoing in your everyday life. Dr. Clavijo-Alvarez will provide detailed aftercare instructions to help you achieve a swift recovery and excellent results. To prolong the effects of a chemical peel, you should take measures to protect your skin, such as wearing a high-SPF sunscreen outdoors. If you are interested in learning more about the benefits of chemical peels, contact our office online or give us a call at (412) 923-5447 to schedule your consultation. Together, you and Dr. Clavijo-Alarez can determine the best way to help you achieve the complexion you desire.